What is a Full Cycle Support Supplement ? What are the ingredients in Full Cycle Support Supplements ? What dosage should I take for a Full Cycle Support Supplement ? Also called “All-in-One” cycle support supplement, a Full Cycle Support Supplement is simply a supplement designed to protect your liver, your prostate, your lipid profiles (heart) and blood pressure against a cycle of prohormone. Full Cycle Support Supplements have a big advantage because they contains everything you need to be fully protected against a cycle of prohormone with one product. 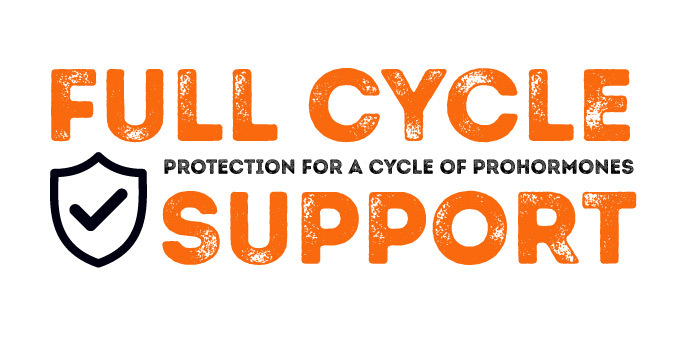 Instead of taking multiple cycle support supplements, you just have to buy and take one product. They cost a little more than a regular liver protection supplement but a Full Cycle Support contains way more than just ingredients to protect your liver. If taking a Full Cycle Support Supplement is considered like easy, it’s also considered very important and necessary for some cycles of prohormones. Ideally, everyone who’s doing a cycle of prohormone should take one. In certain cycles of prohormones, it’s necessary (not obligatory but highly recommended) to take a Full Cycle Support Supplement. * If you’re running a methylated prohormone (Halodrol, Superdrol, Epistane / Havoc…), you should take at least a Full Cycle Support Supplement during the whole cycle. – Milk Thistle (Silymarin) : Under many research studies, it has been proved that the usage of Milk Thistle gives to human a good protection for the liver from damages (toxicity of methylated prohormones). Milk Thistle also has the ability to detoxify a liver. – Hawthorn Berry : The usage of Hawthorn Berry is destined to improve the health of the circulatory system. Taking Hawthorn Berry will reduce/remove the problem of an high blood pressure. – Saw Palmetto : Saw Palmetto is often used in medicine to reduce the expansion of prostate in older men. In most of the case, an expansion of prostate is not dangerous but this situation can be unconfortable. There is no specific dosage for the Full Cycle Support Supplements. Just follow the guidelines from the manufacturer. Where to buy Cycle Assist ? Where to buy Advanced Cycle Support ? Life Support by AI Sports Nutrition is an other great Full Cycle Support Supplement. Life Support contains basically the same proven ingredients than Cycle Assist, the only difference regards the dosage : less pills but pills are more dosed. Indeed, it’s the direct competitor of Cycle Assist ! Life Support cost a little bit more but it’s quite good quality ! Where to buy Life Support ? Where to buy Gear Support ? With this would I need to take a Anti-Prolactin Supplement and Anti-Estrogen Supplement still? All depend of the full cycle support supplement that you will choose. Some have an “all-in-one” formula with anti prolactin and anti estrogen ingredients but it’s not a standard. Your best bet is to ask here with the name of the product or to check all ingredients and compare with our anti-prolactin/estrogen pages. Would you need to take an anti estrogen and anti prolactin with cycle armor? Sorry this is 3 years later, this is believe it or not the most recent thing I could find for research. Are you talking about Cycle Armor from Lecheek Nutrition? If yes, this all-in-one suppplement is dedicated to protect your health DURING your cycle. Anti-estrogen supplements are mostly used AFTER your cycle for your post cycle therapy and there are no anti estrogen ingredients in Cycle Armor. Anti-prolactin supplements can be used before, during and after a cycle depending on the results you want and the prohormones you are taking. There are no anti prolactin ingredients in Cycle Armor. I am currently on halo-v of vital labs do i need a pct and which one?